You are currently browsing the tag archive for the ‘Glasgow Boys’ tag. ‘Is it worth going all the way to London to visit just one exhibition?’ My stamina levels since my prolonged stay in hospital had been at an all time low. Whether I could walk the required distances and last a full day out was also a big question to ask myself. Nevertheless it was a risk worth taking and all worked out well. Over the next few days my legs may have felt like I’d been preparing for another marathon, but the effort had been worth it. I knew I’d be on a winner. When ‘the boys’ are back in town, especially ‘the pioneering boys’, I was certain I’d be well rewarded. The Royal Academy was the destination and it had already been a long walk before I’d even reached the final straight along Piccadilly. Thanks to an escalator being out of action at Warren Street my legs had turned to jelly during the long walk down to the platform. A welcome and reviving cuppa in the Friends Room however always helps to recharge the batteries. The exhibition I was so keen to see was ‘Pioneering Painters – the Glasgow Boys 1880-1900’. Not that well known as a group, and individual names are not familiar, but like the Colourists and so many others, Scotland has a knack of producing some very fine painters. I was hopeful, because of my physical state still undergoing a rebuild, that the exhibition wouldn’t be too busy. The main galleries were closed so the Sackler Galleries were the only space open other than the work showing in the Madjeski rooms. Unfortunately too many others had the same idea as us, that the paintings had to be seen before the show closed and although the first room could be described as busy, the last couple of exhibition spaces were a crush and the work very difficult to view. Be that as it may, high quality artwork can be appreciated even when being viewed from within the confines of a ‘madding crowd’, and there were many excellent examples to be seen. To refer to The Glasgow Boys as a group is a convenient but inaccurate description as they weren’t Boys, they weren’t necessarily from Glasgow or even Scottish – but for a good decade they created inventive, innovative images which followed a common theme. As Vincent was known to paint some very fine sunflowers, these Glasgow Boys could paint a very fine cabbage. Their work was bold and confident without frills and petty details. The first couple of rooms displayed subjects connected to the land, an extension of the example shown by Jean-François Millet. The paintings were as one with the elements, and a relationship forged with those who worked in it each day. From the very beginning it was plain to see that the hands and minds behind these images also knew how to draw. Paint was applied in a workmanlike manner, with daubs and strikes of brush and palette knife, surfaces appeared to have been attacked and attacked again in order for an image to evolve. No gentle caress of brushstrokes here, but marks sculpted and administered by an assured hand, ‘subjects hacked out as though using an axe’. Gradually the palette became lighter and the ochres and brown earth colouring gave way to a brighter palette, as though the sun had appeared from behind a cloud. As we moved through the exhibition sunlight began to flicker across the canvasses and the compositions moved from British to European and even Oriental subjects, the influence of European painting and of Jules Bastion-Lepage in particular became more evident as the work of the group expanded. There were some superb paintings included in this collection and, despite the busy and sometimes inconsiderate company causing me fatigue, to be standing at arms length before them gave me much pleasure and lifted my spirits. Those that stood out for me were Arthur Melville’s ‘Peasant Girl’, James Guthrie’s ‘A Hind’s Daughter’, and George Henry’s ‘A Galloway Landscape’ and ‘Japanese Lady with a Fan’. Perhaps the best known work on show was another piece by James Guthrie, the excellent ‘To Pastures New’, or ‘The Druids – Bringing in the Mistletoe’ by George Henry and EA Hornel but it was a pair of smaller works that really caught my eye. The first was ‘The Principal Street in Gretz’ by John Lavery, the second ‘Hard at it’ another fine study by James Guthrie. Both works were small, and included an isolated figure made an integral part of it’s surroundings. 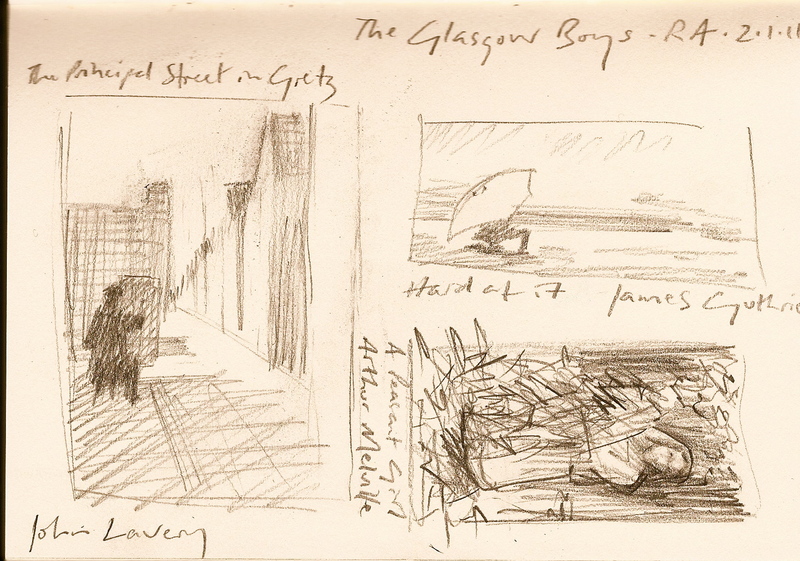 For me they encapsulated what was so special not only about the work of the Glasgow Boys but what excites me about painting in general, and what I am keen to achieve myself. No unnecessary detail, a composition clear and simple, painted confidently with no-nonsense slabs of pure colour. To my eyes, these small statements showed painting at it’s best.